That’s a massive shift. The traditional mix needed to produce an object – a specialized education, room-sized manufacturing equipment, pots of money – is being completely upended. Now, with a workshop or two, and a desktop printer that costs a few thousands dollars, we can all become masters of our own designs. Crowd-funding and open-source design websites are further simplifying the process of us sharing and developing, buying and selling our creations. It’s is incredibly exciting: Design is becoming more democratic than ever. But it’s also dubious. Because, well, maybe some of us aren’t designers for a reason. And handing creative control over to nurses and bankers and teachers will result in a whole lot of stuff that looks like it was made by nurses and bankers and teachers. Idiosyncratic, for sure, faulty, maybe, but where will the beauty come from? A trinket made by 3-D printer at a Hot Pop Factories workshop. For me, the class started so well I started thinking about a career change. The software, called Meshmixer, was easy and intuitive to sculpt with – a bit like digital playdough. Very quickly, the key chain I was crafting began to take shape. On my screen, to my eyes, it looked epic. 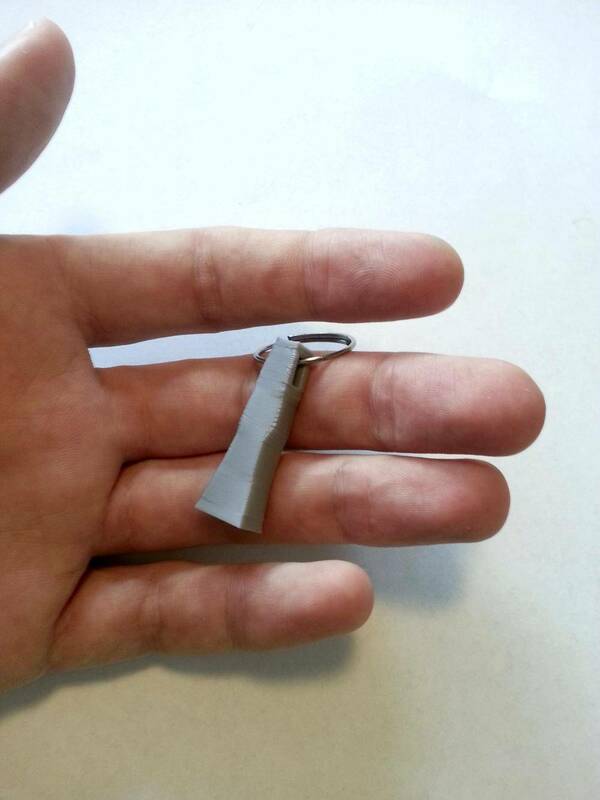 More like a futuristic skyscraper – tall and lean with daring twists – than a humble key chain. “Nice model,” Bi-Ying Miao, one of the workshops co-founders, said over my shoulder. Then the piece was printed and my pride was pricked. Rather than epic, the key chain looked jagged and silly. On my laptop screen, I could blow my model up so it looked imposing and impressive and huge. In real life, my dream skyscraper was a sad, little grey lump. As Matt Campeau, the workshops’ other co-founder, scraped it off the bed of the printer (the layers of hot plastic tend to stick), he said “congratulations,” before handing it to me. I searched his tone for pity. I pocketed the key chain in shame. A quickly dashed sense of euphoria would be familiar to any industrial designer. Professionals frequently switch between loving and loathing the object they’re creating. The difference between an expert and an amateur, though, is that a pro will keep pushing for perfection. But I don’t have the time or humility or even inclination to keep going – do I even need another key chain? A key chain that looked more impressive on the screen. For people who are disinclined to design themselves, open-source design websites might be a better option. Rather than taking full authorship of a piece (and all the responsibility that comes with it), the goal is more to modify, personalize or customize someone else’s idea. TOG, for example, is a new, Brazil-based website retailer that was unveiled at the Milan Furniture Fair in April. It is comprised of a line of professionally designed chairs and tables, including items by French master Philippe Starck. Each piece has customizable options, like shape, colour and material, which can be specified by the customer. For now, the site will ship any purchased products, but they hope their files will one day be downloaded and 3-D printed at home. Starck was in Milan for the launch. As reported on the influential blog Dezeen, he proclaimed that this kind of mass-customization will mean “no more trends.” The ability to individualize everything, according to him, will make it unthinkable for anyone to want anything that looks like something someone else already owns. French designer Philippe Starck’s Lightrock chair. Starck is known for making hyperbolic statements (this is the same person, after all, who declared in 2008 that “design is dead”). And Starck is likely right that a certain subset of people will customize everything they can. Yet, I’m not sure trends are really something worth killing. For one, they can be a powerful barometer, reflecting our combined culture – our collective mood. And for those of us who need a helping hand to make design decisions, what’s really wrong with stealing ideas from our friends and neighbours? Plus, isn’t it Starck’s job to make something so good it doesn’t need changing? Why outsource that duty to the rest of us? As a consumer, I’m more excited about the democratization of design through crowd-funding websites. Forums where I can see what young, up-and-coming designers are doing, offer feedback or comments, help support their work, but ultimately, let them do what they do best. Ideacious, for example, is a Toronto-based site run by independent designer Joshua Brassé. It works on a Kickstarter-type model, but is focused on furniture and housewares, not hardware and gadgets. Creators – which could be anyone, but is mainly professionals – post their concept, how much money it would cost to purchase, and how many customers they need in order to have it manufactured. Interested owners pledge the purchase price, and if enough people commit, the item gets made. Everything else goes back to the drawing board. An even easier model is being proposed by another new, Toronto-based website, Mirens. Co-founders Mike Van and Karen Lau aim to patronize new designers with monthly, online design competitions. Concepts for furniture are submitted then posted to the site. A two-week voting period starts, and whichever item gets the most votes is professionally produced and sold through the site. No money needs to be pledged. If people take the time to vote, Mike Van explained to me, it’s a way of gauging the potential demand. From the first-ever round of the online competition in May, there was a nice looking floor lamp, and a handsome, pine-topped table (which eventually won). But there was nothing I was crazy about. So I waved my democratic right to vote and bookmarked the page for when there will be more to chose from. I still like Ideacious/Mirens model best because it feels most secure. There’s still an adult in the room, so to speak. Brassé, Van and Lau screen the designs before posting to their respective sites. And although they’ll accept proposals from anyone, they specifically target independent professionals and design school grads for submissions – people who have spent years thinking and learning about their craft. And that experience is impossible to replace with the click of my own mouse.